Dubai, UAE, June 10, 2018: ServeU, the facilities management company, continues to pioneer the soft FM industry with the latest innovations to the region’s facilities industry. Serve U’s latest project sees the introduction of robotic automated cleaning devices from Canadian robotics firm, Avidbots. The extensive testing of the machinery is complete with the final implementation conducted in Motor City, Dubai. In association with Al Yousuf Robotics, the automated cleaning devices successfully enhanced the operational efficiency and performance of the common areas of the projects whilst ensuring strict conformance to ServeU’s quality standards. The project was successfully executed to further augment ServeU’s commitment to its customers and to continue its goal of providing continuous improvements through technological solutions. It is estimated that the implementation of these key automations in the Soft FM Process will directly reduce manpower based menial tasks; thereby providing a more strategic alignment of manpower and skills to each project site. Gary also underscored the need to continuously innovate the way the company’s employees deliver their services alongside these technological implementations to stay ahead of the competition, noting the positive trend in the industry. Based on reports from Middle East Facilities Management Association (MEFMA), the region’s cleaning and hygiene industry is expected to grow 275% by the year 2020, driven by dynamic construction activity across the Middle East. Furthermore, the same report predicts that the market segment’s worth will steadily grow to reach AED 300 billion by 2020. To become value-driven players, industry experts say that facilities management companies should harness the power of AI as it will not only revolutionize the industry but ultimately improve a company’s service offering whilst increasing their profit. Named Neo, the Avidbot device is a new technology in the market. 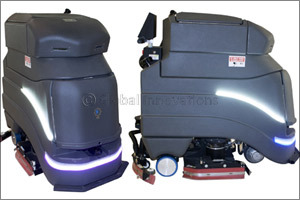 Supplied through Al Yousuf Robotics, Avidbot’s exclusive distributor in the UAE, Neo is a purpose-built floor scrubbing robot that integrates state-of-the-art sensor technology, using lasers and 3D cameras, with AI navigation designed for ease of use, safe operation, durability and maximum productivity. Neo is ideal for large open areas, which are normally maintained by human cleaners using handheld equipment. Deploying the robot cleaner would mean reduced requirement of manpower, at the same time allow cleaning staff to focus on other value-added and higher margin services. “Using these robots will allow ServeU to provide a higher level of quality service with less actual cleaners. In addition to decreased physical strains for our staff, innovations like these would also mean less wastage in consumables leading to reduced costs and reduction in risk of environmental degradation. ServeU estimates that through the implementation of Neo, ServeU can replace the menial responsibilities of five to seven cleaners over one shift. Net savings are then reflected in yearly cost reduction sharing plans, which see mutual benefit to both ServeU and its customers,” Gary explained. “ServeU will continue to invest in innovations and technological solutions, not only for the benefit of the company and our clients, but in order to raise the bar for the facilities management industry. We have yet to see the industry turning point whereby technological implementation in performance-based contracts are the norm. We are looking forward to continuing to drive the industry forward beginning today” Gary concluded.